After doing a bit of digging around, I thought it might be interesting to check out the level 4 windshirt. I wasn't completely convinced that I needed one, or had any use for one, since the level 5 is also an excellent windshirt. Being the geardo that I am, though, I caved...and contacted ORC to place an order. They have two windshirts available: the PCU (Block 0) version, and the MCU (Block 1) version. 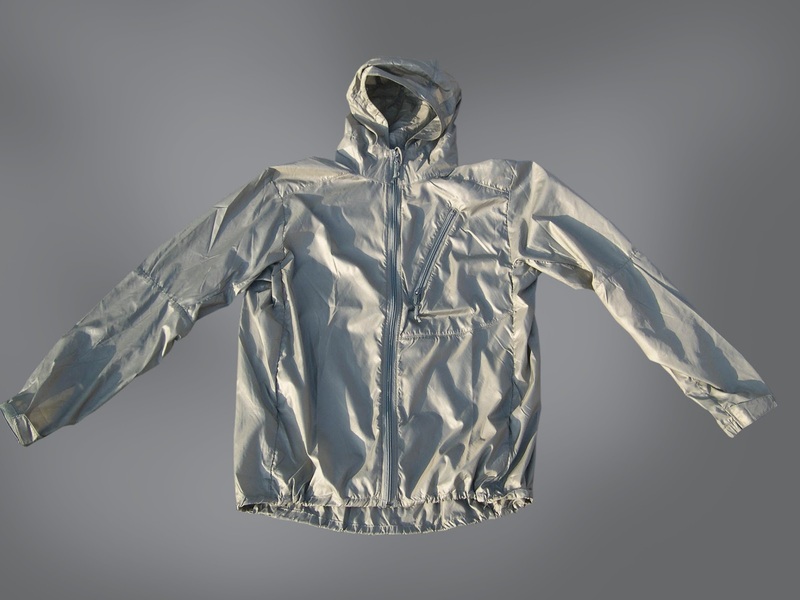 The PCU windshirt is made with the Epic Praetorian fabric by Nextec, has a half zip and is water resistant. The MCU is made with Ecology by Brookwood, has a full zip and is also water resistant. I liked the idea of having a full zip, which would make taking it on and off easier. As well, the introduction of ripstop was appealing, but after reading a review on the Military Morons site, I read that the finish on the MCU had almost a satin-like finish to it. I wasn't too interested in that, so I decided to order the PCU. ORC's PCU contract ended quite a long time ago. From what I've heard, they are not producing it anymore, and are just selling off what they have left. And from what I saw, the rumors are true. Many items that they sell have limited sizing options, and level 4 is no exception. They didn't have any PCU in my size, so that made my choice an easy one. For all you Canadians out there, they will ship via USPS, which was a relief. When I got my package in the mail and opened it up, I was slightly disappointed, but not horribly surprised that the windshirt had the satin-like finish to it that Military Morons spoke of. In 2006, he contacted ORC regarding the finish and they said that it was Brookwood's first go at it, and that future versions would have less sheen. Well, six years later, the jacket still looks like it belongs on the costume rack of Bladerunner. Oh yeah, look at that sheen! When rolled up, the hood actually tucks away quite neatly. Looks aside, it is a fine windshirt. It packs down small enough that you could shove it into any pouch or pocket that you have. It's also so light that you won't even notice you have it in your bag. 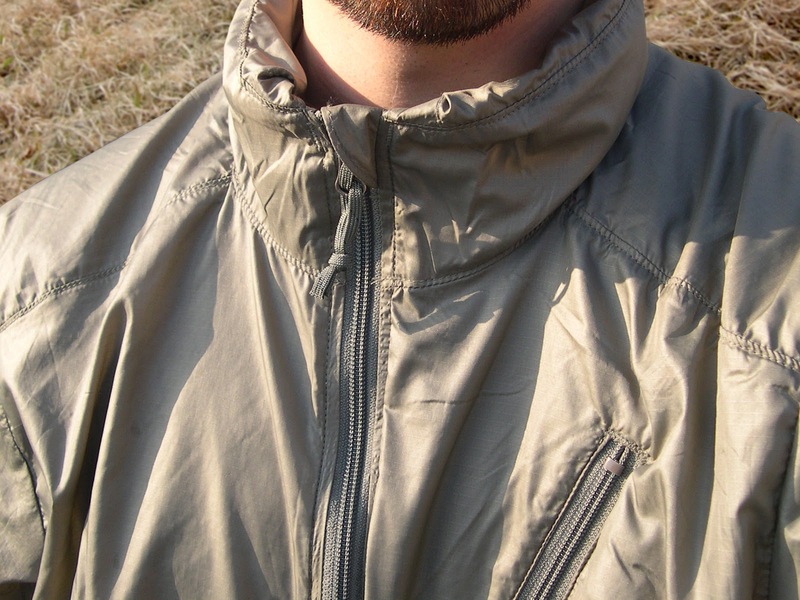 There is one external chest pocket that you can pack the jacket into, if you really felt like it. The hood can be rolled up and held in place with a velcro strap. This is actually a nice feature, because if you were to wear this underneath another level, you won't have issues with the "hood inside of a hood" annoyance. The hood and waist are both adjustable with shock cord, and the cuffs have velcro to prevent drafts. I took the jacket out one night to test it in high winds. It was about 0°C (32°F), and wind was blowing at about 50kph. I had a level 1 T-Shirt to start off, and the level 4 on top. I knew that this was not enough to keep me warm, but this was a test to see how much of the wind it could keep out. What I found was that, for the most part, it did a decent but not a fantastic job of stopping the wind. Overall, I'd say that the level 5 does a better job in this department. The next step was to wear level 1, then level 4, then the level 3 fleece. According to ADS Inc., the level 4 is not an outer layer. Rather, it is a level that should be worn on the inside of your insulation to provide extra wind protection and to act as a vapor barrier. When used as a vapor barrier, it is said that the level 4 can help retain 300% more heat than traditional systems. What I found in this experiment was that the wind cut through the level 3 like a knife, almost negating it's effectiveness as an insulating layer. For static use, in that specific combination of wind and temperature, I would choose another set up. Here is the level 4 rolled up in it's pocket without compression. If you shoved this in a bag with other items, it could squeeze down to the size of a softball. The last set up was to wear level 1, then level 3, then level 4. Within about 30 seconds, I felt my body warming up. After about a minute, I was comfortable. The windshirt and fleece combination cut out almost all of the wind. I'd say that for static use, in 0°C temperatures with high winds, this would be a decent combination (if, say, you left the house without the level 5, and had the level 4 packed in your bag.) According to ADS Inc., the level 4 needs extra attention in regards to wear, if you decide to use it as an outer layer; it is not as durable as level 5 and would probably not last too long, which is why they likely decided that the block 1 version required ripstop. In terms of performance during PT, I've used it in my 30k bicycle commute a number of times. Wearing levels 2, 3 and 4, I was comfortable in temperatures down to -13°C (-20°C with windchill). In temperatures of around 0°C, just wearing levels 2 and 4 was a little chilly. I always bike around with the level 3, in case I get a flat tire or something that puts me into a static activity. For this temperature range, I'd recommend always having an insulating layer handy. In temperatures of 7°C and warmer, I've found that wearing level 1 and 4 leads to overheating. I've only had this jacket for a few months now, and I plan on trying out different combinations as much as I can. As it stands now, I am not finding a lot of use for the level 4. I think that the level 5 is a much more versatile. During active exercise, I've used level 5 as an outer layer in cold temperatures as low as -15°C with levels 2 and 3, and in warm temperatures up to 17°C while staying comfortable. Beyond Tactical's level 5 has very generous pit zips and front pockets that when opened allow excellent air flow. The ORC level 4 however, has no pit zips, or any other type of ventilation. Left to right: Back of the jacket facing up with the hood deployed (Note the velcro strap at the base of the hood). Back of the jacket facing up with the hood rolled and held by the velcro strap. Front of the jacket facing up with the hood rolled. 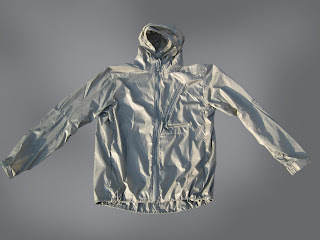 Where I think the level 4 windshirt is really going to perform is as a summer jacket for strolling around, or in extreme cold as a vapor barrier. When you wear levels 2, then 4, then your insulating layer, the windshirt will prevent the moisture from your body from saturating your insulation. This is especially important for when you are out in the cold for a few days. When your insulating layer gets wet, ice will form and will make your insulation useless. Tests under these circumstances are going to have to wait until next year, as this winter has been incredibly mild. Regardless, I will continue to record temperatures and PCU level combinations. This is a First Impressions review after all! As always, once I give this jacket a good work out, I'll do a full review and by that time I should have a good handle of what temperature ranges this jacket is good for, its water resistance, and how well it performs overall. Sure, thing. I'll take some pictures and hopefully have it up for you here by the end of the week. OK. One more… PCU pocket have double zip (inside and outside). 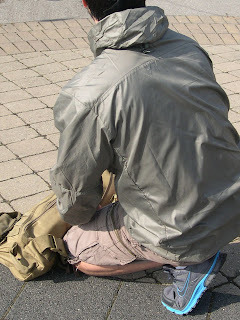 Windshirt rolls up inside itself (into pocket). The level 4 has a chest pocket that is accessible from the outside only. You can roll the jacket into that pocket. The zipper has pulls on both the inside and outside of the pocket. Thanks. Now is clear. It is necessary to pass the velcro strap through the tab. Yes, you need to pass the velcro strap through the loop near the label of the jacket to keep the hood rolled up. Hey Rob, glad you liked the pics! I've been really happy with the level 4 so far. I also found that it works well as a mosquito shield in the summer if you go bushwacking. It's light enough that you don't overheat more than you need to, and it seems to keep most of the bugs off. I'd love to get your thoughts on the jacket once you've given it a beating. What about size? Are the made a little bit bigger so you can have layers underneath or are the regular sized. 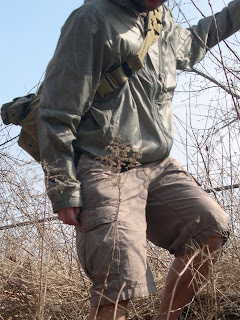 I use Medium - Long in BDU pants and shirt/ jacket. 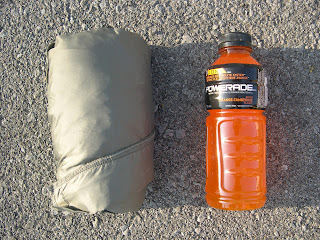 But when it comes to jackets like Arcteryx, North face and such hard Shell i use Large. I`m about 180 cm tall and do have long arms. I was aiming for large, but now i`m not sure anymore. I wear Medium/Long as well. I ordered the Med from ORC. It is big enough to wear your layers underneath like a big fuzzy level 3 as insulation. It is not a tight fit, and is actually kind of baggy. I have long arms too and can move my arms around without the cuffs riding up my arms. If you have any other questions or comments feel free to post here or email me at ontariogeardo@gmail.com. I always enjoy chatting with visiters to the blog! I went ahead and bought size Large, the seller informed me on the measurements so i`m kind of excited if they are right. Got a little concern about the Sheen you are talking about, maybe just wash it cople of times. What about size in the Level 5 softshell, do they run true to size as well or do i need to go up one size? I`m gonna order Level 7 as well, but there i know i take large because of the layers under.. Ya the sheen never really goes away, even with washing. The level 5 softshell from ORC fits fine, however the Beyond Tactical level 5 that I had custom made fit REALLY tight. I had to send it back to be altered. If you are going to go that route, just let them know you want it as part of the layering system. The level 7 is sweet. 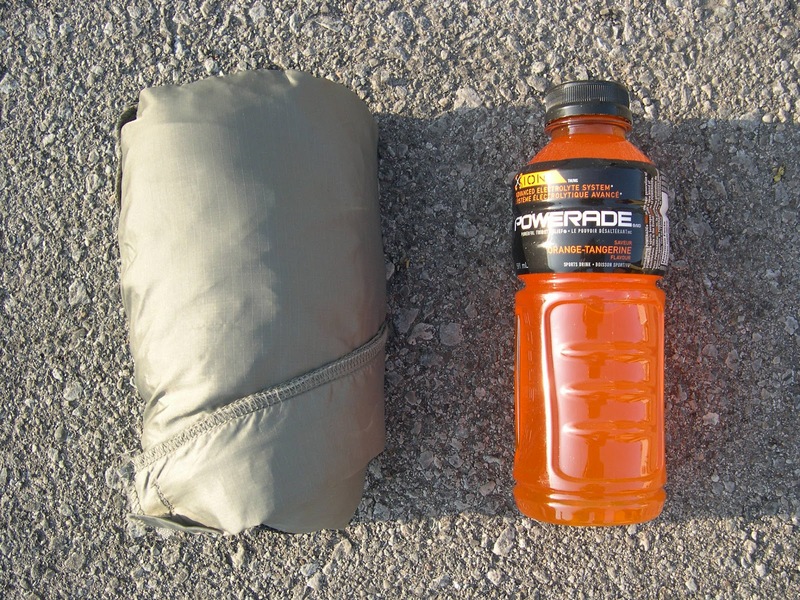 Depending on which one you want, it's designed to fit over even your pack! At some point I'd love to grab the parka. Level 5 is fleece, and very poor at blocking wind as anyone who has worn fleece in wind knows. Hey TAHAWK, the level 5 is the soft-shell and level 3 is the fleece. I totally agree, level 3 is terrible at blocking wind.